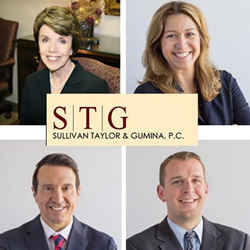 Four attorneys from the Wheaton family law firm Sullivan Taylor & Gumina, P.C. are recognized by Leading Lawyers Network as distinguished in the practice of Family Law. Wheaton family law firm Sullivan Taylor & Gumina, P.C. Three of the Sullivan Taylor & Gumina, P.C. 's attorneys have been selected by their peers to earn the “Leading Lawyers” distinction this year, and one of the firm’s attorneys has been selected as an “Emerging Lawyer” as well. The DuPage family law firm Sullivan Taylor & Gumina, P.C. is pleased to announce that three of the firm’s attorneys have been selected by their peers to earn the “Leading Lawyers” distinction this year, and one of the firm’s attorneys has been selected as an “Emerging Lawyer” as well. Shareholders Maureen Sullivan Taylor, Juli A. Gumina and Raiford D. Palmer earned the “Leading Lawyer” Distinction and Associate Attorney Michael R. Hudzik was recognized as an “Emerging Lawyer”. The attorneys join the firm’s existing “Leading Lawyers”: Senior Counsel Elliot Heidelberger, and Partners Joseph F. Emmerth and Sean M. McCumber. The “Leading Lawyers” distinction is earned by less than five percent of attorneys in the state of Illinois. The attorney selection process is multi-phased. Lawyers are selected through a statewide survey of attorneys which then requires an ethics review and final approval by the over 425 Member Advisory Board. The “Emerging Lawyers” distinction is earned by less than two percent of all lawyers licensed to practice law in Illinois and qualified lawyers must be under the age of 40 or practicing for less than 10 years. The attorneys at Sullivan Taylor & Gumina P.C. were also recently recognized by the AABE, the 24th Annual Award for Business Excellence. This award is given to suburban businesses in recognition of their growth, achievement and community involvement. Sullivan Taylor & Gumina, P.C. has provided compassionate family law services throughout Chicagoland as well as northeast Illinois for over 20 years. As former public defenders, teachers, child advocates, state's attorneys, and therapists, the experienced Wheaton divorce lawyers are able to effectively help clients navigate the legal, emotional and financial issues that accompany complex family law matters. The family law firm assists clients located in DuPage County, Cook County, Kane County, Kendall County, DeKalb County, Lake County, and Will County. Call 630-665-7676 or fill out the online contact form to schedule an appointment today.